The beautifully designed chalet Renard Bleu was built specifically in 2013, right in the heart of Les 2 Alpes, and close to the popular Venosc Square with its many shops, bars and restaurants. Only the Renard Bleu and Chalet Loup Blanc can boast of such fantastic accommodation and facilities in such an enviable location. Guests will appreciate the chalets’ close proximity to the skiing and easy access to the resort centre. Just 500m walk across the square to the new Diable 6 seater chairlift (which last year replaced the gondola, fondly known as the ‘Red Eggs’). This long but fast lift will whisk skiers up to the Les Crêtes area and beyond. 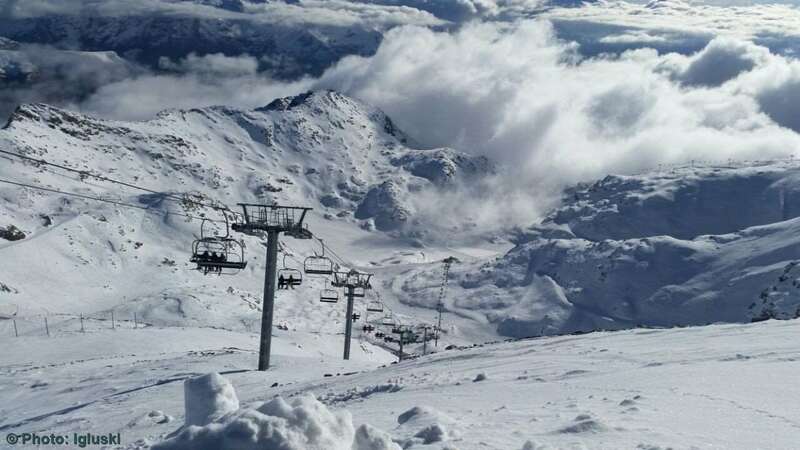 Alternatively take the Super Venosc chairlift, across the square taking you to the Vallée Blanche ski area on the other side of the valley, which is now connected to the main ski area by the Côte blue run and the Petite Aiguille chairlift. The world’s fastest gondola, the Jandri Express, which delivers skiers to the glacier in only 7 minutes, is also an option for ski access each day. The chalet Renard Bleu has been designed to a high specification in a classic alpine style, with attractive facades of exposed stone and warm woods, coupled with fresh open-plan interiors furnished with contemporary flair. The well appointed lounge and dining area of each chalet will include a feature fireplace and plenty of comfortable seating, but the real wow factor lies beyond, through the double French windows which lead to the decked terrace area and the outdoor covered plunge pool. You may be tempted to take a dip at any time, thanks to the pool being both heated and covered in an attractive glass canopy. Each of the Renard Bleu’s bedrooms is a good size with wooden floors, panelled walls and some exposed beams as well as smart modern shower rooms. Many of them also benefit from a balcony. A sauna on the ground floor of each chalet completes the sense of quality and style which our guests have come to expect from recent additions to our portfolio. Approximate transfer times to resort: Chambéry 2¼ hours, Geneva 3 hours. Main entrance. Ski room with heated boot rack. Sauna. Open plan lounge with TV/DVD and corner fireplace. French doors to terrace & heated covered swimming pool.